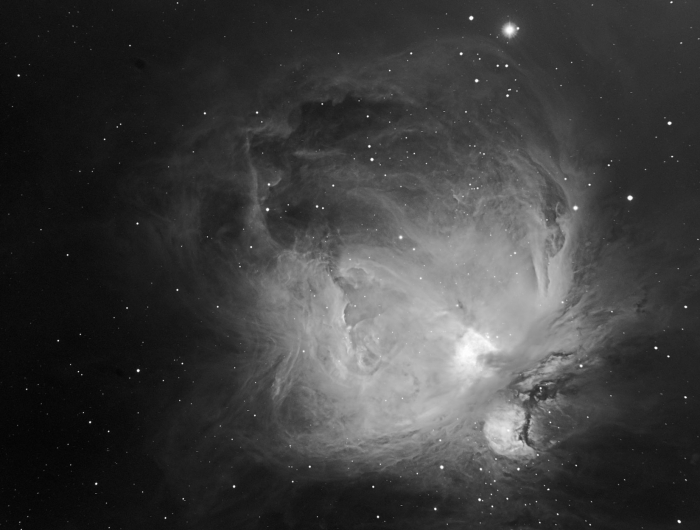 Yesterday, I posted the monochrome H-Alpha image of M42, taken in full moon-light. To get the RGB colour data, I will have to wait for the Moon to go away, or will I? 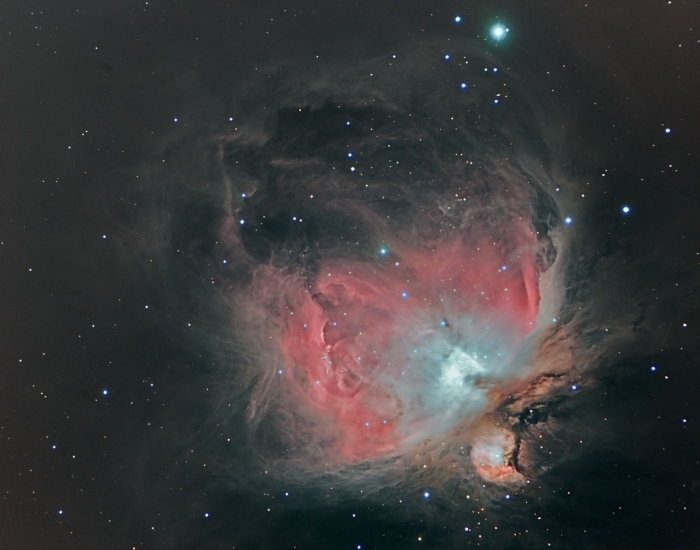 In the image below, I took the RGB (Red, Green and Blue) data from a colour image of M42 I took last year with a one-shot colour CCD camera. The colour image was taken at a much smaller scale with a much smaller refracting telescope, and I had to scale it up in size to align, rotate and fit the new H-Alpha image which I used as the luminosity channel in this image. The colours look a bit washed out here, which happens if you just simply use Ha as luminance, but I think it does look pretty! It just shows that the colour data does not have to have the full resolution (detail) of the luminance data. This is why astronomers often shoot the RGB data for their images with their cameras in ‘binned’ mode. If you bin by 2×2, it means that you have 4 pixels adding up to make one. The camera becomes twice as sensitive and you can expose for less time to get the same ‘depth’ of image. The downside is that the image has half the number of pixels across and down, so you pay by losing resolution. But we’ve just discovered that doesn’t matter too much! It’s amazing what you can do in bright Moonlight! Last night was one day past the full Moon and the sky was flooded with light. Hopeless for imaging faint Deep Sky Objects or DSOs you may think. But using narrowband filters such as H-Alpha wonders can be performed! I imaged that old Winter favourite The Great Orion Nebula, or M42. I took exposures of 15 minutes over more than 3 hours, and the following image is the result. Because the core of M42 is so bright (relatively speaking!) I took a series of short, 15 second exposures and blended that into the core region of the main image. Another advantage of using narrowband filters is that the detail is always very sharp. This is because the band of frequencies of light is very narrow (in this case about 9nm), and the focus is sharper than a full white-light image due to the precise focus you can achieve at these specific wavelengths. For interested readers, the telescope used here was my new 130mm Triplet APO refractor, operating at F/7. 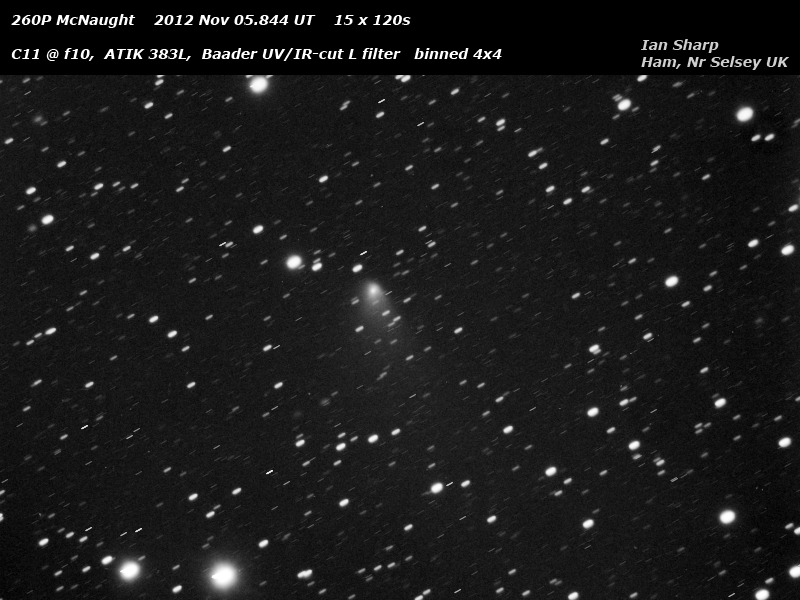 The CCD camera was my ATIK 383L and a 2″ Baader Ha filter. Off-axis autoguiding using an SX OAG unit and SX LodeStar CCD. It seems I’ve caught the remote-imaging bug! 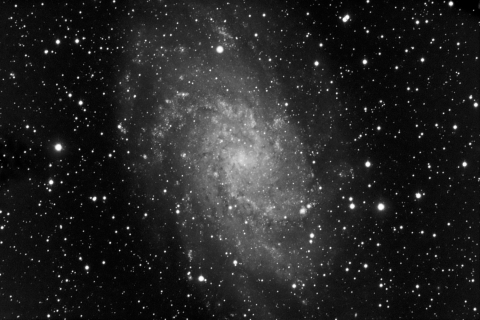 I couldn’t resist having a go at M33 with a bigger ‘scope, so I used the LightBuckets LB-0005 setup which is a lovely ASA 300mm f/3.6 Newtonian and a Finger Lakes CCD camera. 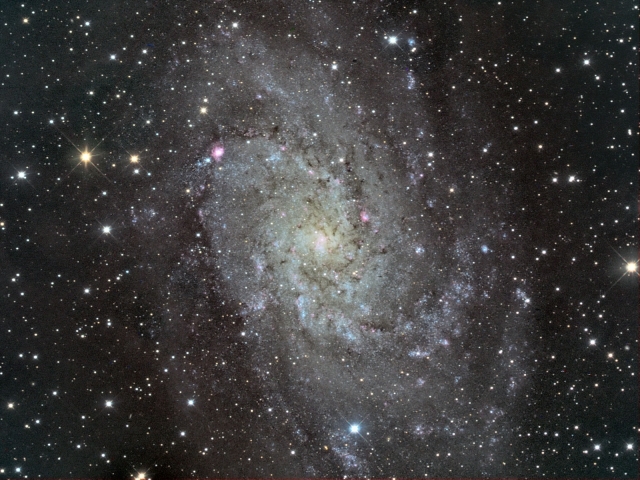 This is an hour of Luminance data taken one night followed by an hour total of RGB data two nights later. Wonderful quality from this fine telescope. Since the weather here in the UK has been pretty bad (for astronomy) recently I decided to have a go at remote imaging. I used the smallest (and cheapest!) remote telescope at the ‘Light Buckets’ facility. This is a high quality 110mm APO refractor based in the Southern part of the Rhone Alps in France. The camera is an SBIG ST-8 non-antibloming CCD , but the main thing was that it was clear! I set up 5 exposures with a Luminance (clear) filter and waited. The next morning, I had an email telling me the run was complete and I downloaded the ‘light’ images along with the calibration frames (Dark, Flat and Bias). The result after a few minutes in Maxim DL and Photoshop CS3 is show below. (click to see the full-sized image). 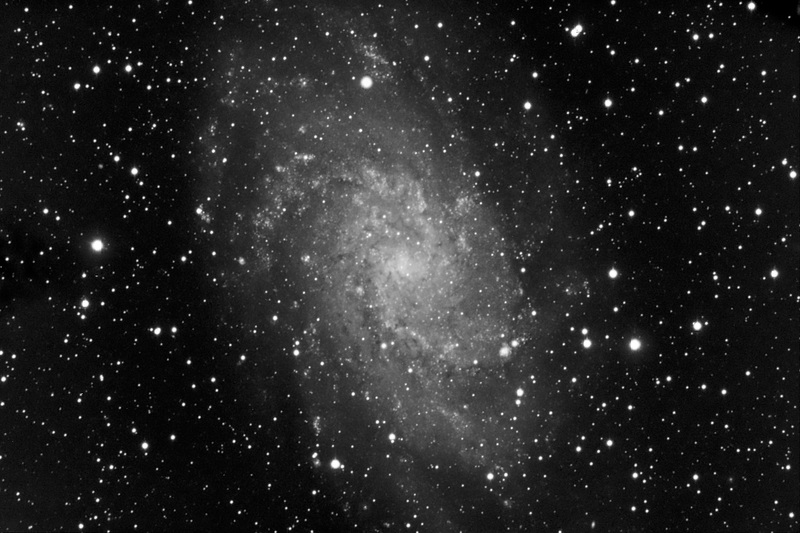 Oh, by the way this is M33 in Triangulum. Here are two relatively ‘bright’ comets that are around at the moment – both currently in the constellation of Andromeda. Bright for CCD imaging that is! The comets are called 168P Hergenrother and 260P McNaught. 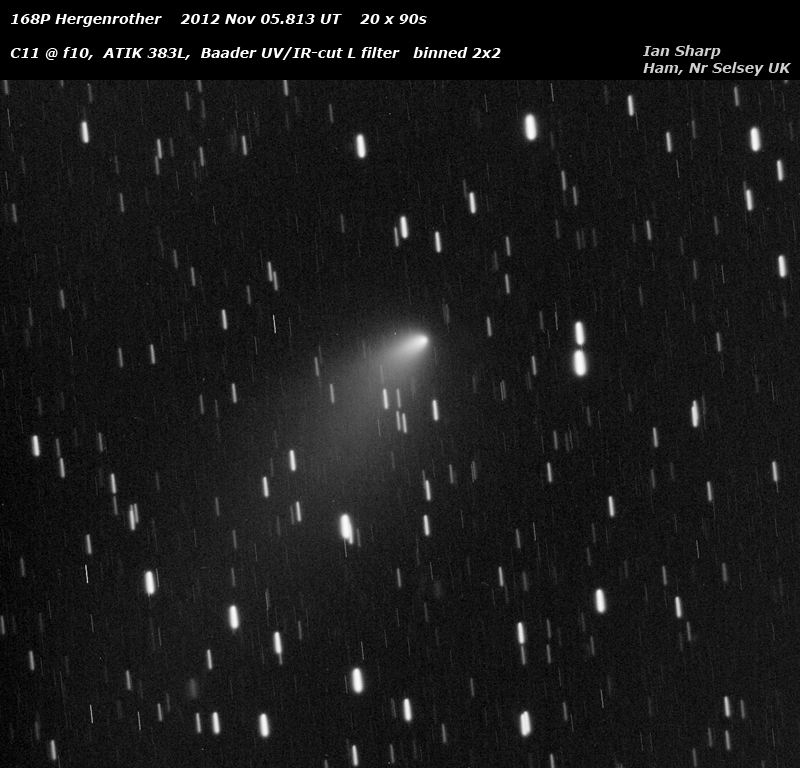 It’s not easy to produce beautifully smooth images of comets and the stars and sky around them. This is because the comets are moving, albeit slowly, against the background stars. So, to produce a decent image, one must take several exposures of a minute or two and then stack them on the bright head of the comet. This produces start-trails and the images look a bit noisy because the normal averaging effect on the background is lost.